We are proud to provide our community of the greater Seattle area with a diverse selection of nutritious vegetables, fruits, meat, & flour, all of which are cultivated using organic farming practices. We have been a family-run farm since 1989, when the Haakensons first started farming this land. Jubilee’s produce is available through its Community Supported Agriculture (CSA) subscription program, in which members of the public support the farm by committing to purchase shares of its produce for a season. 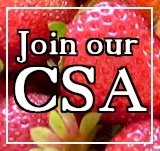 By being a member of our CSA, not only do you enjoy fresh, nourishing food – but you also get to engage with the land & the people that provide that food. “About half of Jubilee Farm previously had been conserved by the King County Farmland Preservation Program. When there was an opportunity to partner with King County to preserve the remaining half through the County’s Transfer of Development Rights Program, PCC Farmland Trust jumped at the chance. Great to see that Jubilee Farm and you, Erick, are still thriving there in Carnation. Best wishes to all of you.